Another sour from P49 today! There was a time when I wouldn’t have been particularly excited about this. 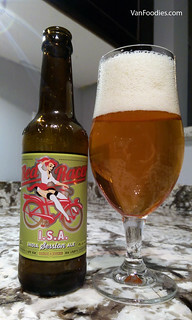 After the first Lil Red, and a few other meh’s, I wasn’t sure P49 was going to be my sour brewery of choice. But they’ve really stepped it up over the last year, and are now on my sour beer thumbs-up list. Practice makes perfect, right? I recently (OK, maybe not that recently) had the opportunity to attend a release event for a new beer from Central City – Sour Brown I Barrel Aged Sour Ale – the first in what will become an expansive Sour program, including upcoming Sour Red, Kreik, and Framboise releases. As people may know, I’m a pretty big fan of sours, so I approached this release with no small amount of expectation. I wasn’t disappointed. 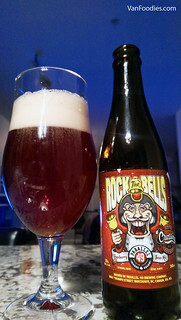 This beer offers an aroma of red wine and sour berries, while the taste is balanced nicely with a smooth sour acidity, a bit of wine tannins, berries and oak. It all came together nicely and honestly, I think it’s an excellent first effort. Gary Lohin deserves a serious high five. I went home that night with a plan to buy two, maybe three bottles depending on the price. I knew it wasn’t going to be available right away at my favourite local beer store so I waited a few weeks. I knew it would be available at the brewery first, likely for a couple dollars less, but I like the convenience of my local store. I just had to make sure I was on the ball, because I didn’t expect a huge quantity available, and it would probably go fast. So I kept checking in until I finally saw it on the shelf. 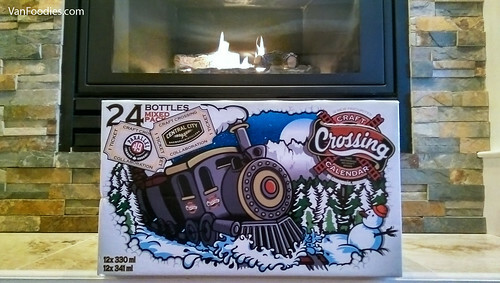 Last year Parallel 49 and Central City released the Mystery Gift Holiday Countdown Advent Calendar. And while it was a good, fun experience. There were a few minor quibbles. This year P49/CC have stepped up to the plate in a big way with its new Craft Crossing Calendar. Instead of only 1 unique brew each, they’ve created 6 uniques each. That means half the box is uniques! I hadn’t even bought my box yet and I was already sure this year was going to be a lot better than last. They could have made 2 or 3 uniques each (still an improvement!) and gotten away with it, but they didn’t. So right off the bat I wanted to give a huge props to both breweries for putting in the time and effort to make this calendar extra awesome. Great way to start! 2015 has been a monster year for sour beers in BC, and I’m so glad to see the trend continue in the calendar here. I really enjoyed this beer, cranberry and sour make a damn fine combination, and with the brett influence added we have a beer I would gladly drink again. Repeat from Day 14 last year. For my second post, I wanted to introduce a new, regular(ish) segment. One of the great things about craft beer is the multitude of brews suitable of cellaring. A space that has traditionally been reserved for wines, more and more beers are being released that have the ability to age without going bad (assuming they are cellared properly). As a fairly recent convert to the craft beer scene, I haven’t been able to build up a large trove of cellared beers just yet. But I’m working on it, and I thought it would be cool to share the results. Today I’m going to introduce two beers I’ve just added to my cellar, Vancouver Island’s Hermannator Ice Bock and Driftwood’s Lustrum Wild Sour Ale. I’m going to tell you what they taste like right now, and then at some unspecified point in the future I’m going to revisit them and see how they’ve changed! In the case of Hermannator, I have enough bottles to revisit it multiple times. I’ve spoken (tweeted, really) with Vancouver Island Brewery and they’ve confirmed that, in the right conditions, Hermannator can be be aged for upwards of 5 years!